As with most other countries, there's a great deal of unclaimed money sitting idle in Canada. At the end of 2007, according to the Bank of Canada, it totalled around 938,000 accounts, with a monetary value of close to £159 million, in unclaimed balances. 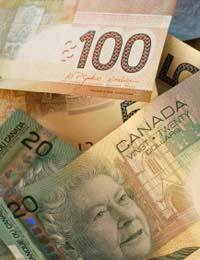 In Canada, the term unclaimed balance refers not only to bank accounts, but also covers term deposits, traveller's cheques, credit card balances, certified cheques, bank drafts, and money orders; it's inclusive, referring to many kinds of financial transactions. However, before you become too excited, be aware of one thing: a lot of the money that's being held by the Bank of Canada (and the oldest unclaimed balance is more than a century old, dating from 1900) is in the form of deposits which are under $500 Canadian - 19% of the total unclaimed balances, in fact, so any windfall might prove to be a small one. A bank account becomes dormant in Canada if there's no activity, i.e. deposits or withdrawals, after nine years. That said, what will happen initially is that if there's no activity after two years the bank will write to the account holder, and once again after fives years of inactivity. After nine years have gone by and no money has gone into or out of the account, the Office of the Superintendent of Financial Institutions will publish details on it, along with all other unclaimed balances, in the Canada Gazette. After one more year has passed (making a total of 10 years) the unclaimed balances all go to the Bank of Canada, leaving them in one central location. How Long Do You Have To Claim? If the unclaimed balance is above $500, then it can theoretically be held forever; there's no expiration on it. If it's less than that amount, though, the Bank of Canada will only hold it for 10 years. In other words, small accounts will only be kept for a total of 20 years (10 at the bank, and another decade at the Bank of Canada). The Bank of Canada makes finding an unclaimed balance very easy by having a centralised database that can be searched online. All you'll need is the account holder's name and the province in which they lived, although in the case of common names you might need to refine your search a little. When you locate the appropriate unclaimed balance, you'll then need to fill in a claim form and send it to the address listed, with the necessary signatures and documentation. In most instances you won't be dealing directly with the Bank of Canada, but the bank that held the account. They will confirm you as the account owner and forward everything to the Bank of Canada, after which it should take between two and three months to process your claim. Where you're the heir to an estate, which has an unclaimed balance, or associated with an organisation that's going for an unclaimed balance, things are a little different. You'll need to contact the Bank of Canada directly with documentation to prove you have the right to the money, as well as proof that the deceased was the owner of the account. But once again, everything should be concluded within approximately three months.